Vault Festival 2019 sees the return of London’s most extraordinarily diverse festival of the year. Celebrating music, theatre, comedy and food, featuring 400 shows and 2,000 artists – all spanning 8 weeks. 2019 will be Vault Festival’s 7th year running and is set out to be its greatest yet. Running from January 23rd to March 17th, the underground festival brings together the best artists and the best food. Vault Festival has teamed up with Carbon Free Dining, the United Nations-backed Restaurant initiative. They have chosen to demonstrate their love for the environment by partnering with the programme. 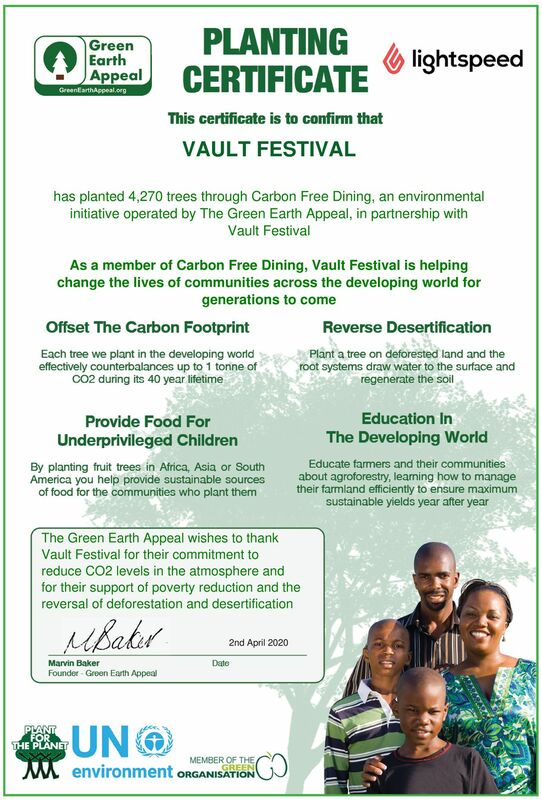 Being Carbon Free Dining Certified, Vault Festival will plant thousands of trees, effectively offsetting the Carbon Footprint of the food it serves. This is done by simply giving diners the opportunity of planting a single fruit tree with each bill for an optional 99p, an outstanding display of corporate social responsibility.